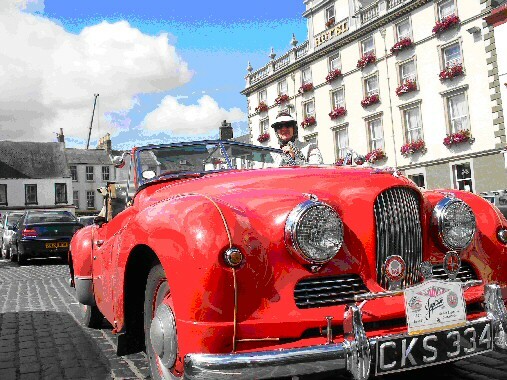 The city of York was the start point for the fifteen cars taking part in the 2007 Jupitour and as we left home we cautiously remarked that this was one of the very few occasions, this summer, that we had started an outing with the hood down. As always we like to begin our journey relatively promptly to ensure that we get the maximum from the day and by arriving at our city centre riverside hotel at lunchtime, this gave us the whole afternoon to explore the sights. Here we met up with David and Jenny Kennedy and enjoyed an afternoon river cruise before heading for the city centre and a visit to the famous York Minster. At our riverside hotel, there was little evidence of the June floods; however our Concierge at The Queens Hotel commented that the underground car park, that now housed the Jupiters, had been under six feet of water…..very comforting! 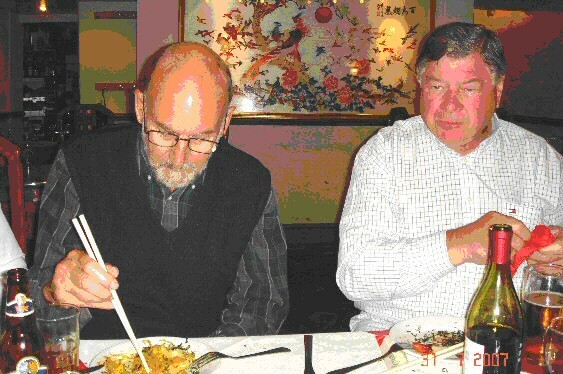 By the evening, most of the ‘tourists’ had arrived and we enjoyed a Chinese ‘banquet’ at one of York’s city restaurants opposite Clifford’s Tower. 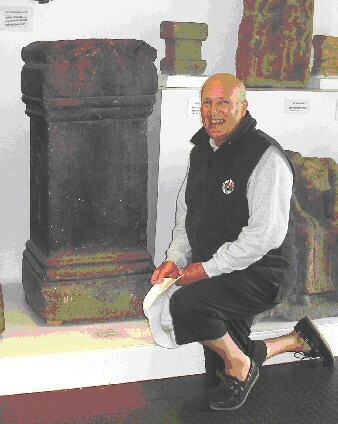 The Jupiter ‘tourists’ at York – Tom & Pauline Chapman; Gordon & Wendy Cooper; Tony & Liz Day; Ken & Omaira Graham; Tony & Angela Mumby; Edmund & Ghislaine Nankivell; John & Sue Powter; John Blankley & Ann Humphreys; Howard & Jacqui Bryan; Dave Stimpson & Lesley Williams; Tim & Ann Wise; Alistair Gregg drove over in his Jupiter and joined us for the evening. 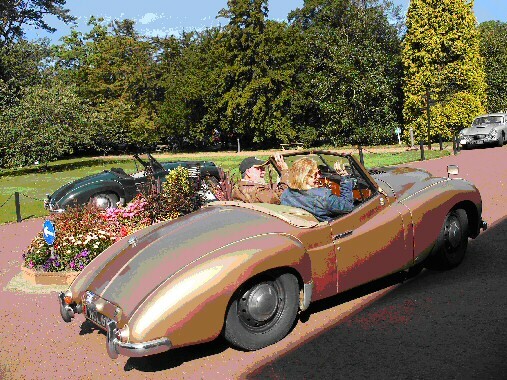 Also on the tour in their modern cars were Bob Mooney & Eloise Tomkins and Peter & Barbara Welch, their Jupiters not being quite ready yet…. The Jupitour route books and touring details were the topic of conversation during the evening and the return walk to the hotel along the riverside was a perfect way to end the day. Our Jupiter remained safely tucked up in the garage and we took to the open topped bus for a tour of the York city stopping off for a visit to the National Railway Museum. We have been here once before, but this year the extra attraction was the Yorkshire ‘EYE’, a 200 feet high ‘big wheel’ that rotates high above the roof-lines affording some spectacular views. We walked along the top of the preserved City Walls, two miles long and two thousand years of history… The evening was spent as guests of Howard & Jacqui for a splendid evening meal which launched the official start of the 2007 Jupitour. 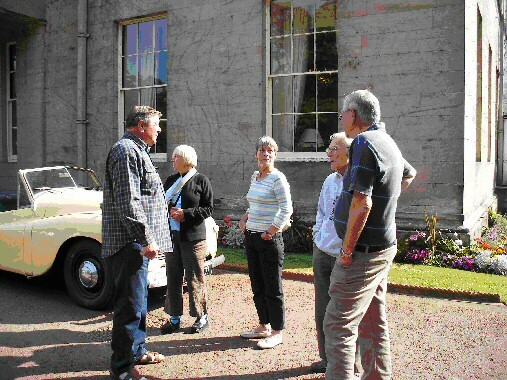 Here we met up with the final members of the tour, Angus & Shirley Bell and David & Barbara Peacock. Day Three - Thursday 2 August – Fine and Dry. Everyone was encouraged to use the Route Book which had designed to ensure that the best scenery and places of interest could be enjoyed. Each car travelling at its own comfortable pace between hotel stops; knowing that at least we were all on the same route … or so we thought! 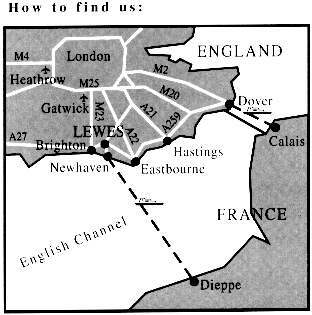 There was a directory of mobile telephone numbers included in the pack allowing us all to be able to keep in touch with one another. York to Derwent Manor via Fountains Abbey, a World Heritage Site, and the Bowes Museum where we had a pre-arranged light lunch followed by a guided tour. The vast collection of art treasures is housed in a purpose built French designed public art gallery that was first opened in 1892. 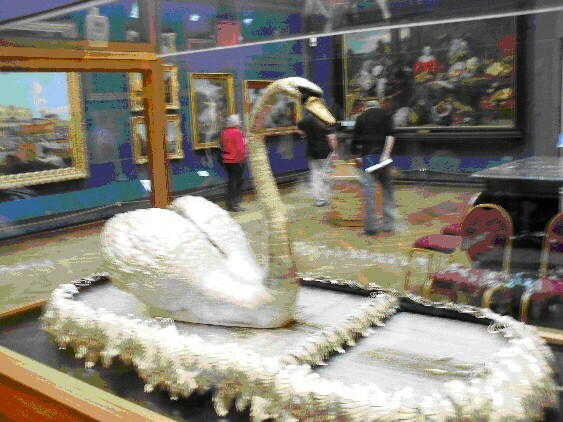 One of the main features is The Silver Swan dated from 1773, this full sized, life like, musical automaton gracefully moves on a ‘stream’ of silver threads, dipping its head into the ‘water’ to collect small silver fishes…. 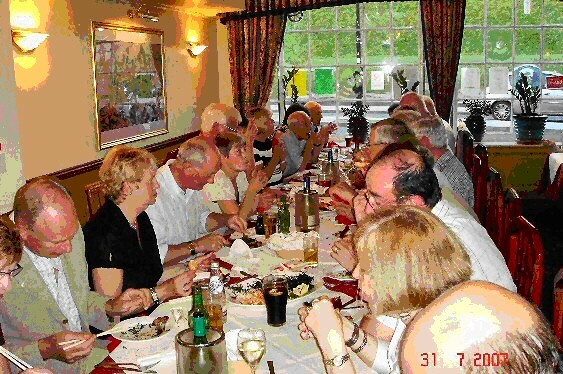 Everyone arrived safely at The Derwent Manor and after suitable refreshment, settled into the Dining Room to re-cap on the day and plan for tomorrow. Day Four – Friday 3 August – Overcast but dry, threat of light rain later. We made an early start for the journey from Derwent Manor to Gatehouse of Fleet, via the Roman Fort of Housesteads and Gretna. 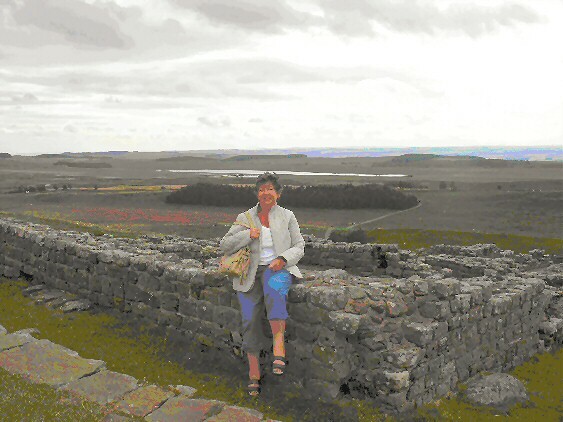 Hadrian’s Wall and Housteads Fort was built when the Roman Empire was at its height. The Wall is approximately 150 miles long and snakes across some of the most dramatic landscape, it was originally built to protect Rome’s most northerly frontier. At the altar of JUPITER "The greatest and the best"
Wherever possible, our journey followed the route of the Wall, mainly ‘B’ and ‘C’ roads, predictably straight but with hazardous hidden dips and summits. By the time we re-joined the main road towards Gretna it had begun to drizzle and the hood was deployed for the first time on this tour. Gretna provided a welcomed stop and the ‘Designer Retail Outlet Park’ provided an equally welcomed break….’I just can’t believe it takes so long to choose a pair of sandals’. By the time we left Gretna, the drizzle had turned to light rain and it stayed like that for the remainder of the journey. We decided to stop off at The Devil’s Porridge where there is an amazing exhibition that tells the story of the greatest munitions factory on Earth….in 1915 the British were losing the war through lack of ammunition until 30,000 men and women came from all parts of the country to work at the massive war factory built on the Solway.. When Sir Arthur Conan Doyle, creator of Sherlock Holmes, visited HM Factory Gretna in 1918, he described the explosive paste which was mixed by hand as the Devil's Porridge. It is a very apt name for the highly explosive mixture of nitro-glycerine and nitro-cotton. The dried paste was processed into cordite - which looked like uncooked spaghetti - that was then put into shells and bullets to propel them. For the remainder of the journey we kept to mainly the ‘A’ roads, but always in sight of the Solway Firth. 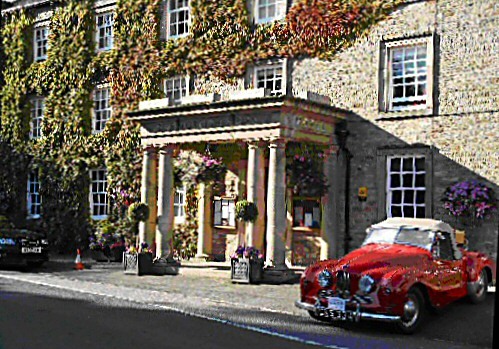 By late afternoon, we had arrived safely at The Cally Palace Hotel, a stunning country house that offered the ambience of a bygone age and the most opulent accommodation. Our particular room offered a view overlooking the Croquet Lawn…where we spied Howard and Angus demonstrating the fine art…we took advantage of the heated indoor swimming pool, Jacuzzi and Spa Pool which proved an excellent way to unwind and prepare ourselves for dinner. Day Five – Saturday 4 August - Warm, dry but the threat of rain later in the evening. This was planned as a ‘free’ day. 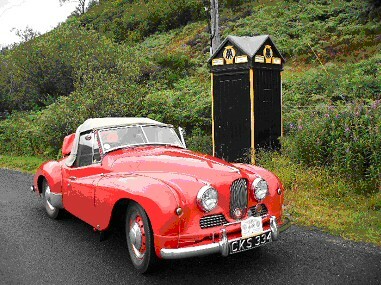 There were a series of driving options, out to the coast or inland and across the foothills. We elected to stay local and visited the many coves and beaches around Wigtown Bay and the Solway Firth. 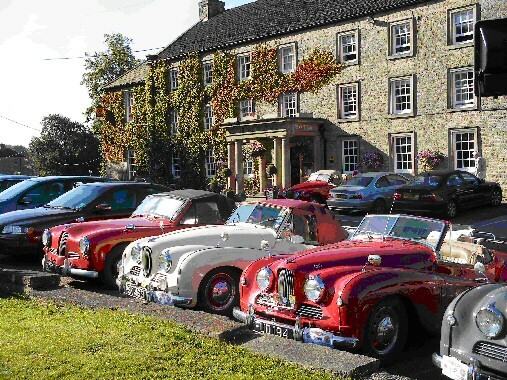 We eventually came to Twynholm and the David Coulthard Museum where the staff came rushing out with cameras when they heard the sound of the flat four in the car park…made us feel a bit like celebrities …here we were coming to look at iconic Formula One motor cars…and here they were giving us loads of attention!! Our visit coincided with the televised qualifying session for the Hungarian Grand Prix and all attention was focused on the wide screens. This has to be the most complete collection of memorabilia for any Formula One driver, past or present and covered the early years of Karting through to the current Red Bull Formula One Team. 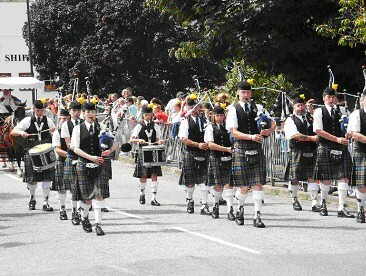 Leaving Twynholm we headed to the town of Gatehouse of Fleet where we watched the local carnival parade, complete with a Pipe Band, before returning to the hotel where we enjoyed a walk around the vast estate in the hope of seeing some red squirrels, and woodlands before retiring to the leisure facilities and the pools. So far all the cars had behaved themselves with no more than routine checks being the order at the start of each day. Day 6 – Sunday 5 August - Persistent rain, heavy at times, poor visibility. The Croquet Lawn, which we had admired from our window, was now submerged. 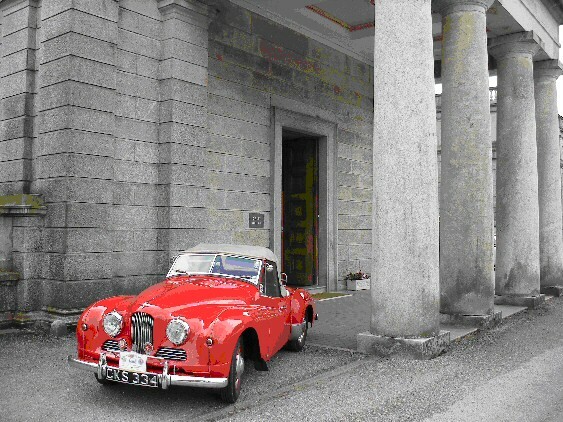 The persistent rain made it quite difficult to remain dry whilst loading up the Jupiter and the Concierge kindly allowed me to reverse the car under the columned entrance so that at least the luggage and cockpit remained dry. As had become the norm, we were the first the leave and set out to follow the Route Book. Quite early into the journey we became aware that we were travelling in quite a remote region of Dumfries and Galloway with only nomadic sheep for company; the journey took us via the Lowther Hills and Loch Ken to our mid point destination of Drumlanrig Castle which is on the Queensbery Estate. 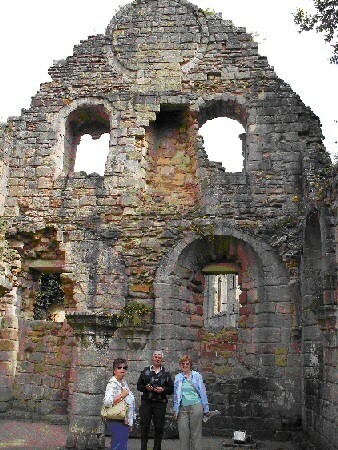 This is part of the Buccleuch Group, which includes our very own Boughton House Estate between Geddington and Kettering. However, the Queensbery Estate is some 120,000 acres whilst at Boughton they have to make do with ‘just’ 12,000acres. Drumlanrig Castle is built of rich pink sandstone and is known locally as the ‘Pink Palace’. We were allowed to park on the circular drive right in front of the main entrance and I have to say even in the rain it was an impressive sight. 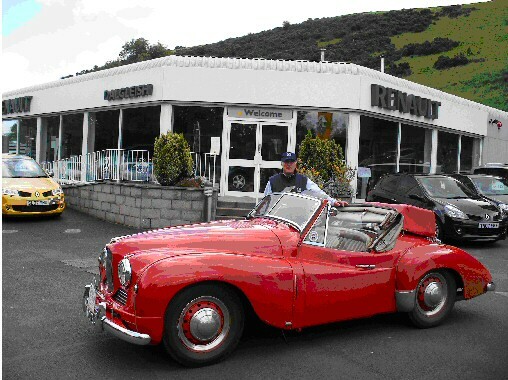 After an excellent lunch, it was onwards via the Tweedsmuir Hills to our hotel at Peebles. A short diversion was necessary in order to fill up with fuel (petrol stations being few and far between) before our main route took us via the lead mining town and museum of Wanlockhead and towards Broad Law which at 820 metres is the highest of the Tweedsmuir Hills. 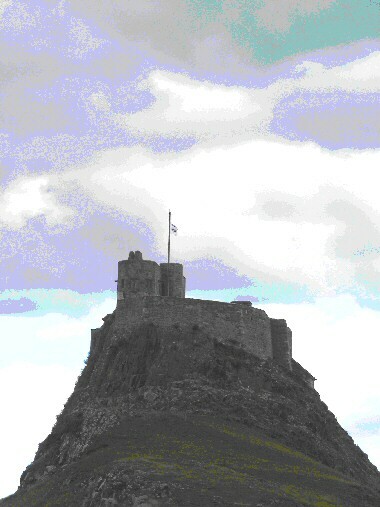 This area was immortalised by the novelist John Buchan in his novel The Thirty-nine Steps. Here the roads, whilst shown as ‘B’ on the maps were really no more that single carriageways bordered by rocky crags, or deep ditches, or sheer drops of several hundred feet….quite challenging by any standards, but in the rain in a 55 year old motor car….not the best of experiences. Water was cascading from the high ground in the most spectacular fashion and through the swirling mist along the foothills of Broad Law where we were climbing a 25% incline (1 in 4) and just on a bend, we met a 4x4 coming down the single track road with no where to go. We had to reverse several yards into Passing Bay and at this point, even leaning forward I couldn’t see any road over the nose of the bonnet…definitely a white knuckle ride. Bizarrely, two cars had encountered over heating problems which were the result of split water hoses, whilst only one had a problem with a wiper motor which was understandable as the wipers had been in use for the best part of the day. After a whole day cooped up in the Jupiter it was quite nice to stretch our legs and take a walk along the High Street in Peebles which is a lovely, seemingly tradition border town with distinct architecture and styles of buildings that are testament to a degree of long established wealth and prosperity. Peebles also has the distinction of being ranked as the Top Independent Retailing Town in Scotland, and second in the UK, for its range of independent shops and 'home town' identity in contrast to the ubiquitous 'cloned towns' predominant in other areas….and a mental note was duly made by The Navigator of one or two ‘must buys’ for in the morning. Day Seven – Monday 6 August - Broken cloud, occasional sunshine, risk of light showers. This was a Bank Holiday in Scotland, but like many communities, it was, in the main, business as usual. 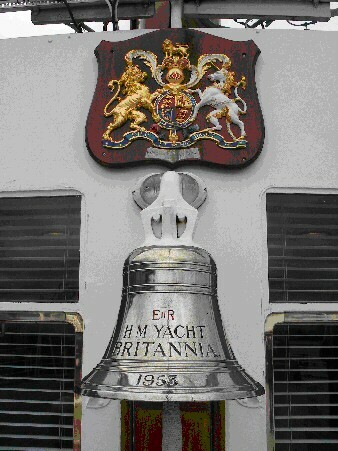 The organised coach trip to Edinburgh and visit to the Royal Yacht ‘BRITANNIA’ at her moorings in Leith, was viewed as a welcomed treat after the ‘challenges’ of yesterday. There is something quietly magical about stepping into a period when the monarchy meant something different and treading the decks & gangways that royalty and dignitaries of state had trodden during 44 years of faithful service to Queen and country. The Royal Yacht is of the similar period to the Jupiters, 1953, and the over whelming impact is that the monarch’s own on board accommodation was quite austere and somewhat cramped, but you have to remind yourself that first and foremost this was a boat and as such very functional. 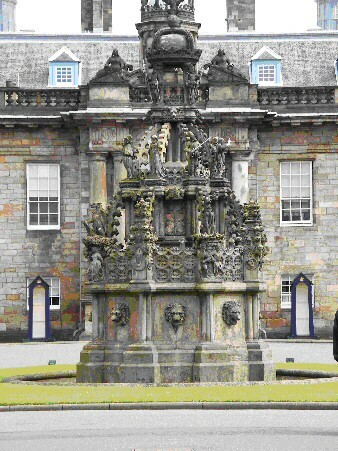 The tour of ‘BRITANNIA’ took up most of the morning and the coach then took us from Leith into Edinburgh and The Palace of Holyroodhouse, the premier royal residence in Scotland. Here we took lunch and as we had never been to Edinburgh before, we elected to see the sights by way of one of the City Tour buses. It was the period of the Edinburgh Festival and the city was alive to the music and performances, of what seemed like, hundreds of ‘artistes’ at every square and street corner. We concluded the day with a trip to Edinburgh Castle and the two hours hardly did the experience full justice, but we did see The ’Stone of Destiny’ The Coronation Stone – returned in 1996 to its rightful place. 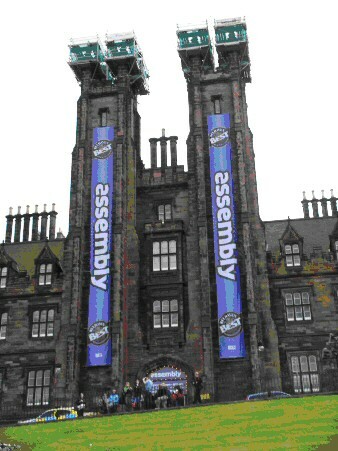 Our visit also coincided with the Edinburgh Tattoo which was being held within the Castle and subjected to strict security measures, not only in the Castle but also the approach roads which meant that the rendezvous arranged for the coach was no longer applicable and we hurriedly had to re-assemble and second guess the outcome of the re-routed coach. Fortunately we were all of like-minds and seemingly without any hitch we all were safely and promptly transported back to Peebles. Day Eight – Tuesday 7 August – Light cloud, occasional sunny spells. 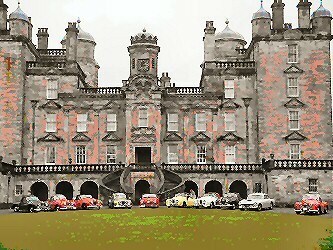 Today’s journey was to take us from Peebles to Linden Hall near Morpeth, Northumberland, and was another day of choices. My preference was to visit Hawick and the site of the garage where our Jupiter was first delivered to Dovemount Motors on 12 February 1952 prior to registration on 1st March; whilst Glenys really wanted to visit the Holy Island of Lindisfarne. As it happened we were able to do both and still have time for a swim at our hotel before dinner. Before leaving Peebles, we heard the distinctive sounds of a flat four and a very quick almost instinctive headcount confirmed that it wasn’t one from the ‘tour’. 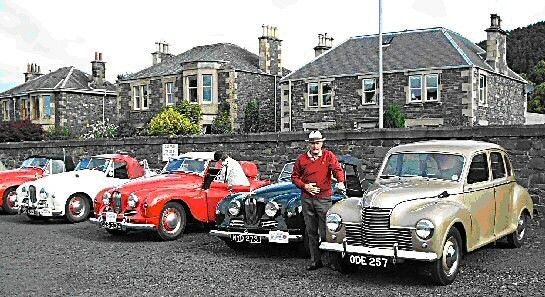 As the ‘sound’ entered the car park, we were delighted to welcome Jack Kirk, a member of the Scottish Jowett Car Club and his Javelin who had travelled some 50 or so miles to join the tour for the morning. 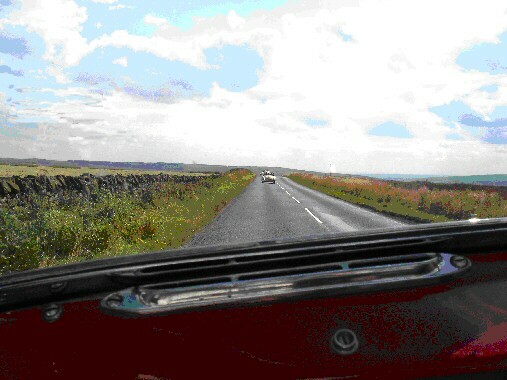 From Kelso to Coldstream and then on to the A697 before turning east on the B6353 to wards the coast. As the access to Lindisfarne is across a causeway we had carefully considered the tides and determined that between 12 noon and 8pm the causeway was open to road traffic. 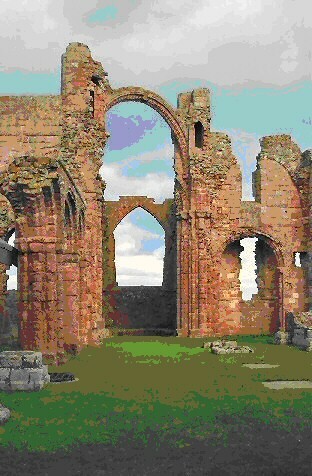 Lindisfarne is something of a mystical place, a castle built in 1550 on a mound known as Beblowe Craig and a Priory that pre-dates the castle by several hundred years is known as The Cradle of Christianity and one of the Holiest Anglo-Saxon sites in England. From Lindisfarne we set off for the final leg of the day’s journey via Alnwick (more about this tomorrow) and onto the B6341 across the Northumberland moorlands and our hotel at Linden Hall which was to be our base for two nights. 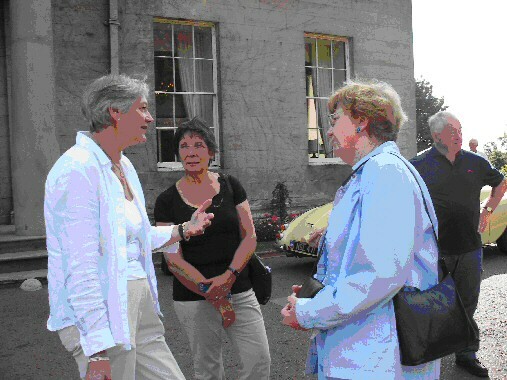 Everyone arrived safely at Linden Hall, no mishaps and over dinner the events of the day were recounted and plans for the following day reviewed. Day Nine – Wednesday 8 August – fine and dry with plenty of sunshine. 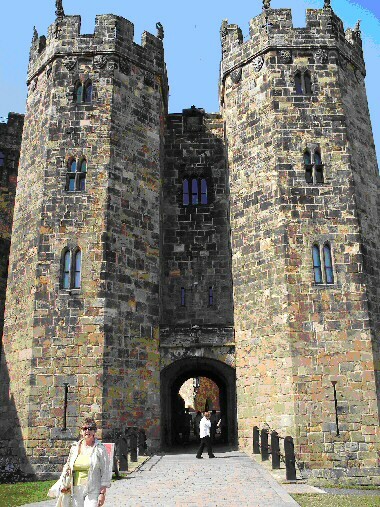 Today was a planned visit to Alnwick Gardens and Castle which meant re-tracing our B6341 Northumberland moorland route. This was no hardship, the heather was just turning to colour and the undulating roads afforded some of the most magnificent and dramatic views. The landscape was a contrast of heather-laden gentle moorlands and craggy rock faces; long straight roads punctuated by sudden hairpin bends; level plains and challenging steep inclines; aqueducts, viaducts and the ruins of a monastery…and all this over a seven mile journey. Arriving at Alnwick Gardens we were ushered into our pre-planned reserved area where the display of Jupiters provided an added attraction for the day visitor. The Duchess of Northumberland's vision was to create a beautiful public space accessible to everyone; a garden for contemplation, fun, inspiration and education. 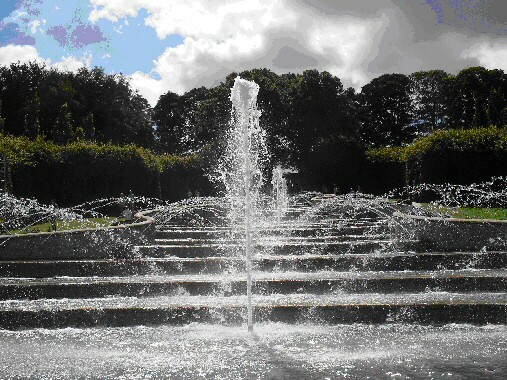 The Alnwick Gardens certainly does that. It is both formal but welcoming; children are actively encouraged to paddle in the water features and physically enjoy the cascades. 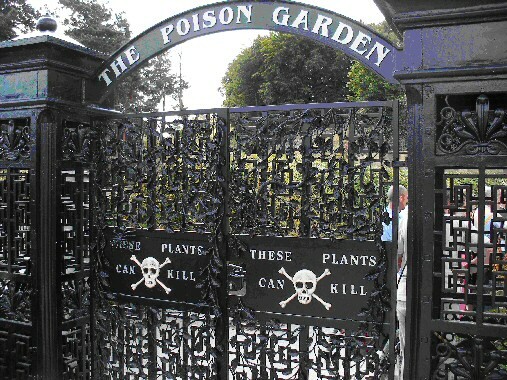 There are a series of themed gardens including The Poison Garden which has understandably controlled access and guided tours. 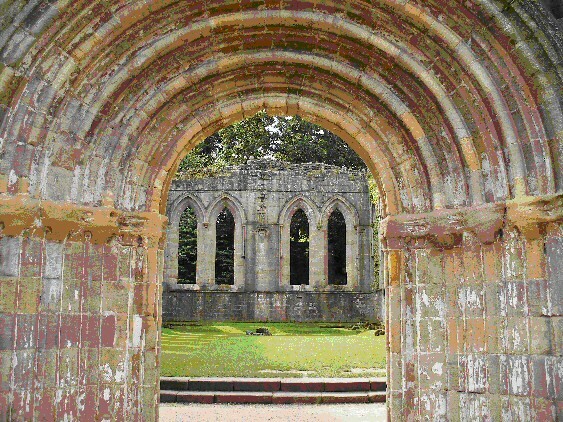 This was a most enlightening experience and I will view with caution future offerings of rhubarb crumble…..
A most excellent group lunch had been pre-booked in the glazed Pavilion which provided uninterrupted views of the grand water cascades and the surrounding avenues of sculptured hornbeam trees. 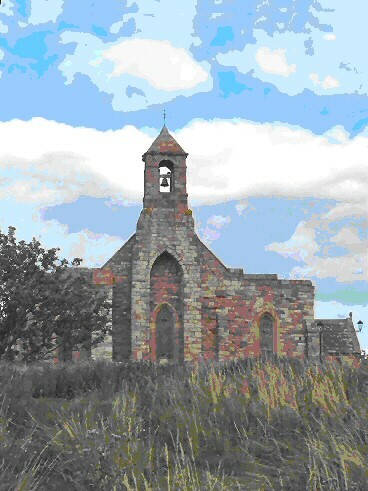 The afternoon was again a series of options, some opted to travel up the coast to Lindisfarne or across to the fishing village of Caster and up the coastal roads to Seahouses and Bamburgh. We elected to stay on site and visit the adjacent Alnwick Castle, which was the film set for Hogwarts and the Harry Potter series. 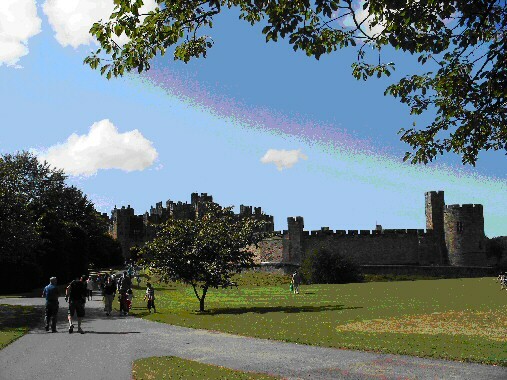 Alnwick Castle is very much a living castle, at the heart of thriving estates and businesses; and is still a family home, as it has been for nearly seven hundred years. The final episode of the visit was The Tree House which is one of the largest wooden tree houses in the world. 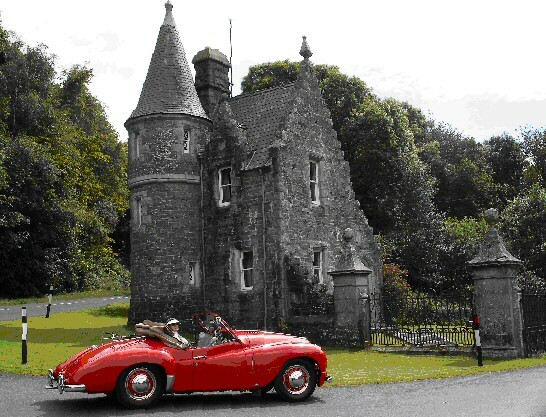 It comprises of some 6000 sq ft of turret topped cottages and provides an unrivalled experience for all visitors. A magical TREETOPIA with walkways in the sky. Returning to the hotel, via our favourite moorland route followed by a visit to the Spa Pool was the perfect way to relax after a busy day. Day Ten – Thursday 9 August – Fine and dry, light broken cloud, sunny intervals. As we joined the assembly in the car park and packed the Jupiter, it was becoming clear to all that this Jupitour was coming to a close and that today was to be the final ‘touring’ day, and what a ‘touring’ day it turned out to be. 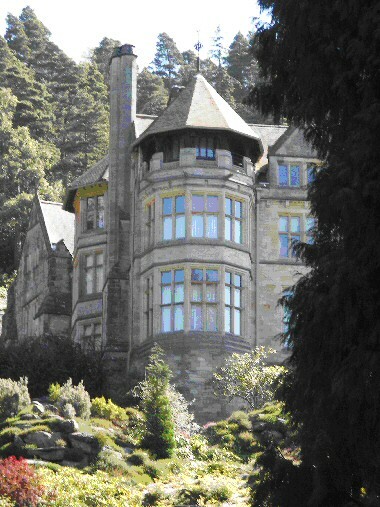 Firstly, a visit to Cragside, the country house built on Cragend Hill near Rothbury in 1863 as the home for industrialist and entrepreneur Lord Armstrong (of the Armstrong Whitworth engineering empire). In 1868, a hydraulic engine was installed, with water being used to power labour-saving machines such as laundry equipment, a rotisserie and a hydraulic lift. In 1870, water from one of the estate's lakes was used to drive a Siemens dynamo in what was probably the world's first hydroelectric power station and the house was the first house in the world to have electric lighting. 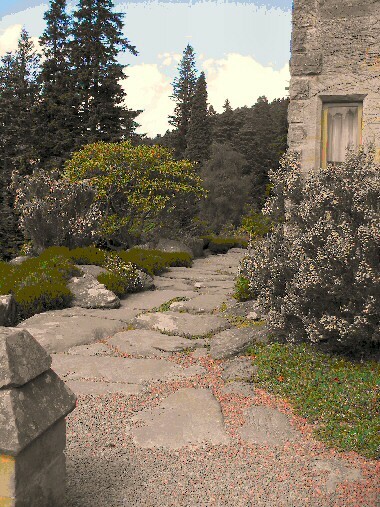 A series of steep pathways linked the rock gardens, formal gardens and woodlands which are set in some 4 sq km of this rocky hillside. The tour of the house was for 1pm and really had to be quite hurried if we were to keep to our schedule which was to be at High Force in the forest of Teesdale some 75 miles south by 5.30pm. 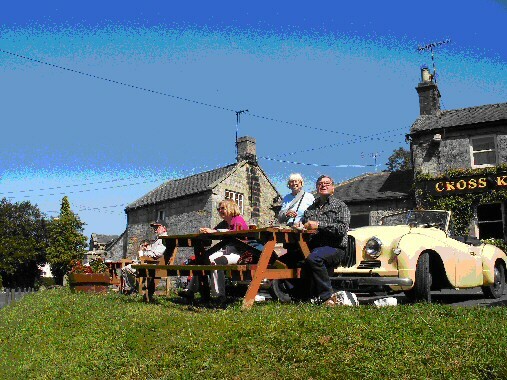 We joined up with the Jupiters of Ken Graham and John Blankley as we left Cragside and soon found a suitable hostelry where we took total advantage of the sunshine as we enjoyed a late lunch. This most pleasurable excursion was to prove to be a time pressure on our schedule and it was about 3pm before we finally set off. 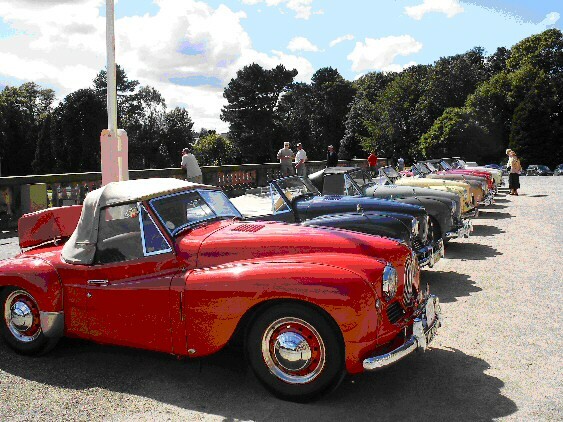 The route was across the Cheviot Hills and the Northumberland National Park and provided some exciting and challenging driving. However, we kept together in an extended convoy over hills and dales and all was going really well until we encountered a series of heavily laden farm trailers which prevented a clear onwards passage. Over about a mile, the first and second Jupiter managed to get through, however by now the agricultural convoy had been joined by a further set of equally heavily laden trailers which formed an impassable obstruction that eventually cleared once we encountered the main road into Hexham. By now we had lost our travelling companions as we traversed the final stretch of moors through Allendale and Wearhead and into the Teesdale Valley. High Force, the highest waterfall in England, was the penultimate stop of the journey and was listed as closing at 5.30 pm. 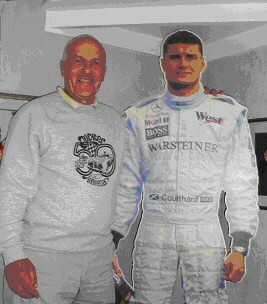 We had tried really hard to ensure that we could meet the timetable as this is a ‘must see’ spectacle. As we approached the empty car park at 5.45pm we decided that we could always come back tomorrow ….but no, the gate was still open. We parked up and hurriedly walked towards the open gate. 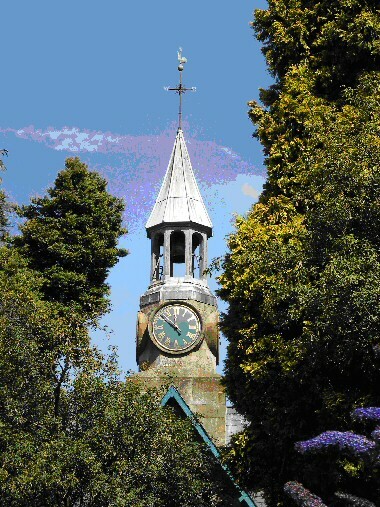 Yes, the gate house closed at 5.30pm but just leave your £1 in the ’Honesty Box’ and enjoy. …. The woodland walk leads you to this spectacular sight. As you begin the descent down the gentle slope, the well-maintained path twisted and turned giving a different view every few yards. The muffled rumble suddenly turned to a roar and the sight astounds you. 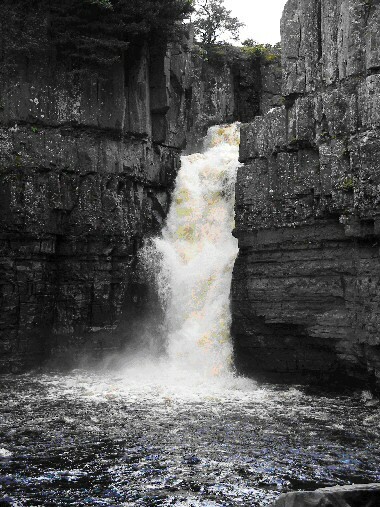 High Force commands your respect… definitely a ‘must see’. As we left High Force, we noted that it was now 6.30pm and we still had a further 20 miles to the Morritt Arms where a champagne reception at 7.30 pm was planned in preparation for the ‘farewell’ dinner. 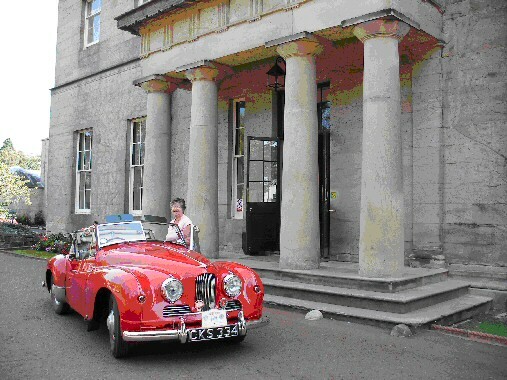 Inevitably we were the last to arrive in the car park but pleased in the knowledge that we had managed a very full day. Suitably refreshed we enjoyed a most excellent dinner where Jacqui & Howard were presented with a large serving salver from the Jupitouists in appreciation for all their hard work organising the event and ensuring that everyone enjoyed the occasion…. 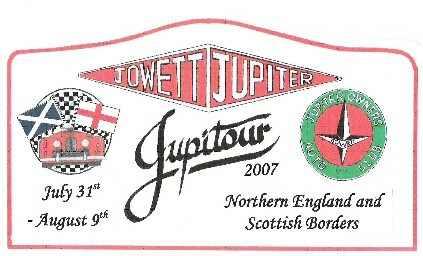 Howard is calling it a ‘Drip Tray’ as a reminder of the Jupiter on Tour….and as Jacqui remarked, every time it is used it will force a wry smile and fond memories of the Jupitour 2007. Day Eleven – Friday 10 August – slightly overcast, sunny intervals. So that was it! We packed up for the final time of this Jupitour, bade our farewells and speculated as to when we might meet up again and where the next Jupitour might take place. A successful and memorable ‘tour’ of 1064 miles, good company, 6 hotels, some of the best landscapes, a whole list of attractions and spectacular sights, all without major mishap, ….. and we just had a further 172 miles to see us safely home. P.S. Some of you might have been following the Robbie Coltrane series ‘B-Road Britain’ we wonder if the idea for this series came from reading about Jowett motoring adventures…..! The Jupiter website Magazine page.